Underscoring the need for raises and better working conditions to be negotiated in the next teachers’ contract, UFT President Michael Mulgrew warned on March 12 that New York City schools were losing thousands of teachers to the surrounding suburbs, which pay more and have lower class sizes and better teaching conditions. In the past 11 years, more than 32,000 New York City teachers resigned, with more than one in eight leaving for teaching jobs on Long Island and the counties to the north, new union research revealed. “I’m sick and tired of New York City being the farm system for the suburban districts,” Mulgrew said at a press conference at union headquarters. “No industry can be successful if 50 percent of the people who walk into it walk away,” he said. Another disturbing trend the union uncovered was the increasing number of teachers in the prime of their careers — those with six to 15 years of experience — who were calling it quits. In 2008, mid-career resignations represented 15 percent of total attrition; in 2013, those resignations accounted for a whopping 43 percent of the total, he said. Mulgrew called that unprecedented exodus "a new phenomenon" driven by the pernicious policies of the Bloomberg administration, with its overemphasis on testing, burdensome paperwork and disrespect for the city’s teaching force. “That points to a lack of stability in your teaching force,” Mulgrew said. By their sixth year, he said, teachers have typically mastered the necessary skills and can help their newer colleagues as they struggle with students in crisis and the lack of curriculum and supplies. 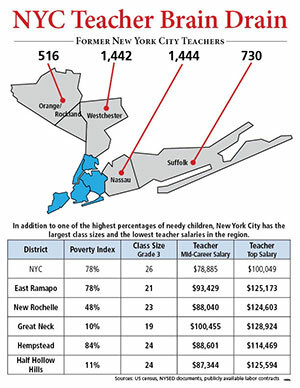 Mulgrew also noted that compared to New York City salaries, mid-career teacher salaries in suburban districts can be $10,000 to nearly $20,000 higher and top teacher salaries can be $15,000 to $25,000 more. Suburban teachers also enjoy better working conditions, with smaller class sizes, newer school buildings and the necessary supplies, he said. Mulgrew said the new data collected by the union was in keeping with the results of its recent survey in which a quarter of the teachers polled said they have contemplated leaving their jobs within the next three years. Mulgrew noted that the best education systems in other countries and the best school systems in the United States have one thing in common: high teacher retention rates. The UFT and the Department of Education are in the midst of contract negotiations. The teachers’ contract expired in October 2009. This story was originally published on UFT.org on March 12 at 5:53 p.m.